Guest Post by Geoff Russell. Geoff is a computer programmer, vegan, environmentalist, and more generally, a ‘by-the-numbers’ polymath. For a list of all of his posts on BNC, click here. He also has collections here and here. The following article was sent to ABC’s “Drum” website about a month ago. They rejected it. I have asked why, but they refuse to give a reason. I would have thought that when a journalist so publicly associated with the ABC as Mark Willacy, makes serious factual errors in a book, that the ABC would publish a reasoned critique. Apparently not. ABC journalist Mark Willacy recently launched a book: “Fukushima: Japan’s tsunami and the inside story of the nuclear meltdowns”. The ABC is giving the book plenty of exposure and gave Willacy time off to write it. Back in March this year I wrote an article on poll results exposing deep nuclear ignorance in Australia. Only 10 percent of Australians understood clearly that a nuclear explosion was impossible in a nuclear reactor. The other 90 percent occupied various positions along a spectrum between certainty of the facts and being equally certain that the impossible was possible. Willacy doesn’t just believe that the impossible is possible, but that it’s already happened. His book reveals similar knowledge deficits not only in the Japanese public, but in many of those who oversaw Japan’s Fukushima meltdown response, including nuclear industry workers. Willacy states clearly (p.128) that the Chernobyl reactor underwent a nuclear explosion in 1986. Not true or even possible. Power reactor fuel is simply wrong stuff. It’s as different from bomb material as potting soil is from gun powder. And even if you loaded a reactor with bomb grade enriched uranium, there’s no detonation mechanism. Designing and building the latter is one the hardest design jobs in building a nuclear bomb. Confusion about categories of explosions may seem a small thing, but we’ll see that it extends to a more general ignorance about the nature and scale of radiation risks. Here’s a couple of pictures illustrating the difference between what Willacy claimed happened at Chernobyl and what actually happened … a steam explosion. The image on the left is of a nuclear explosion (the World War II Hiroshima bombing) which flattened about 700 hectares of buildings and killed about 60,000 people with its blast heat and pressure waves. An additional similar number died in the following weeks from various injuries, including radiation received from the blast. The image on the right is the aftermath of the Chernobyl explosion … a steam explosion which blew the top off the reactor, killed two workers and mangled a building. But, as you can see, it didn’t even have enough power to knock over a tower a few metres away from the blast. A steam explosion, together with a larger radiation release could definitely have happened at Fukushima if workers at the plant hadn’t succeeded in releasing steam (including radioactive material) from the reactors. This was definitely worth avoiding, but it could never have been a nuclear explosion. Nor could it have possibly killed any workers in the anti-seismic command bunker hundreds of meters away. The worker death fears described by Willacy were clearly very real to them, but they weren’t at any risk of death other than when out of the bunker and close to the reactor. As at Chernobyl and at the recent fertiliser explosion at West near Waco in the US, it’s usually the firefighters taking the big risks. The West explosion left a 93-foot crater and killed 14 people, mostly the firies … this was a much, much bigger bang than Chernobyl. The 1947 Texas fertiliser explosion was a very much bigger bang again, it levelled 1,000 buildings, killed 581 people and even knocked a couple of planes out of the sky. But Chernobyl was certainly the biggest ever nuclear accident, and also probably the biggest ever journalism screw-up. A few days after the accident, current economics editor at The Age, Tim Colebatch, reported a Western diplomat citing a Kiev source that 2,000 dead was in “the right ball park”. The UK daily papers screamed that number in huge print. 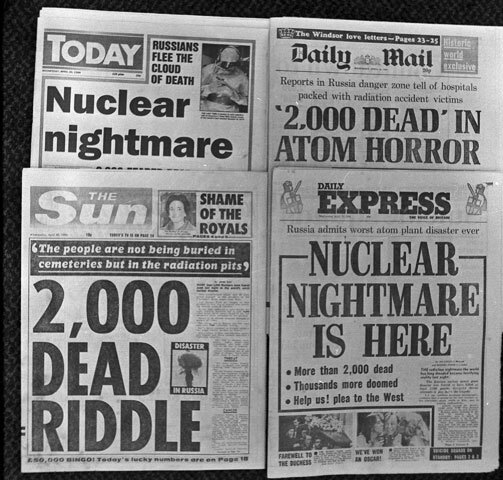 The Daily Mail ran with ‘2,000 dead’ in atom horror while The Daily Express ran with Nuclear nightmare is here “More than 2,000 dead, Thousands more doomed, Help us! plea to the west”. The Sun added a mushroom cloud for good measure. Nobody, it seems, even bothered to ask if this number was even plausible. It wasn’t. 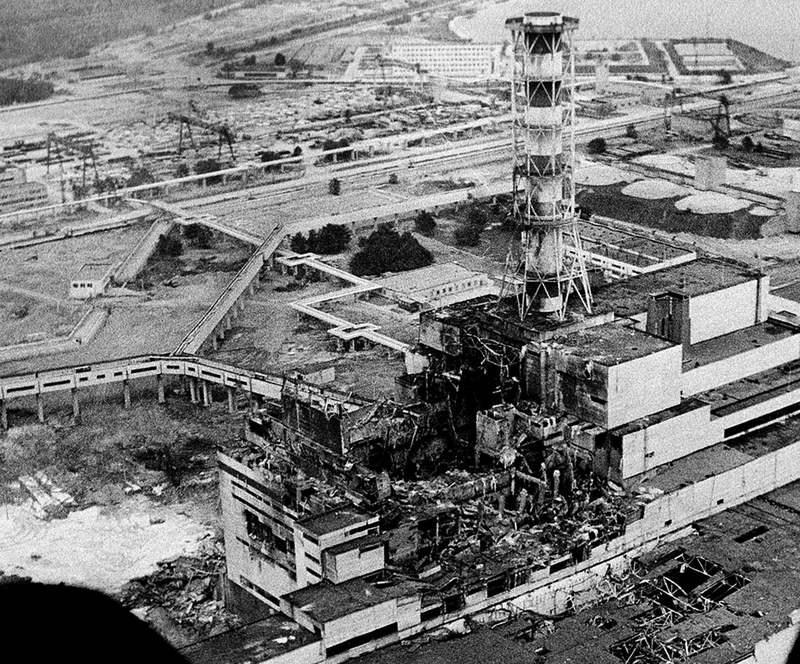 How can you kill 2,000 people when a reactor like this typically has a staff of less than 200? Fatal radiation doses typically take weeks to kill, so how do you kill 2,000 people in just days? The 29 firefighters who died at Chernobyl did so over a three month period, with 5 dying from burns. 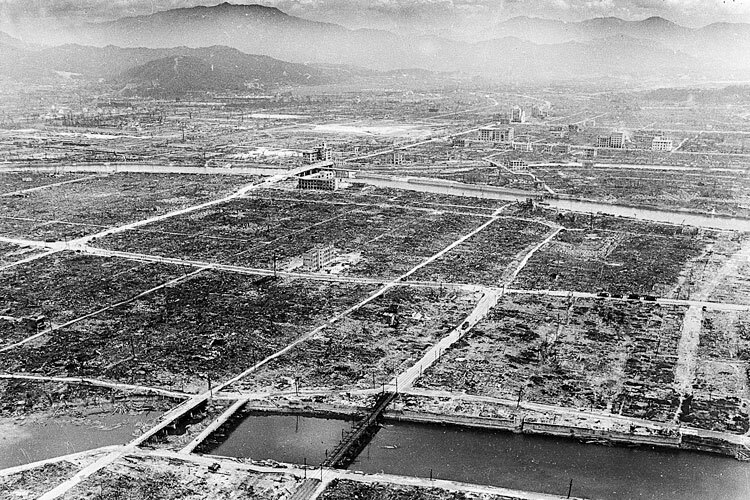 Anybody who bothered to fact-check their story against what happened during the atomic bombings of Japan in World War II would know there could be no deaths in four days except from the explosion and that no reactor explosion could kill more than the immediate staff. That sloppy journalism has been rattling around for over 25 years with a devastating legacy. Now the ABC and Mark Willacy’s book are giving it new legs with false claims about nuclear explosions. Perhaps the then Prime Minister Naoto Kan shares Willacy’s false belief about the Chernobyl explosion? We have to assume, based on Willacy’s account, that Kan was seriously worried about the possibility of having to evacuate Tokyo and of the possible end of Japan as a world power. Were such concerns warranted? Willacy’s frequent mention of them without comment or analysis gives them an unwarranted credibility. Consider again Chernobyl with its full blown steam explosion and much larger radiation release. The three surrounding countries, Ukraine, Belarus and Russia all experienced extensive radioactive contamination and for the past 27 years more than a few people have been eating food with levels of radioactivity frequently far higher than current Japanese regulations permit. And the outcome? All up, there have been about 14 million cases of cancer (based on national statistics available on Globocan) in the three countries. Had the three countries experienced Australian or US cancer levels, there would have been some 20 million cancers … an extra 6 million. Willacy cites an estimate that the eventual Chernobyl cancer death toll might be 4,000. Even if true, this pales next to the impact of far more potent carcinogens than radiation. Simply being fat is a far more potent cancer risk for the individual concerned than the kinds of radiation doses received by any member of the public from either the Fukushima failures or the Chernobyl accident. These are the solid statistics which Willacy either doesn’t know or has chosen not to include in his account for whatever reason. Instead, Willacy gives legitimacy to talk of a Tokyo evacuation as if it was a real prospect because of real risks. The Chernobyl experience shows this to be simply false. Are there any real large new cancer risks in Japan? It’s worth discussing one cancer in some detail to understand the difference between the big players on the cancer stage and the small time grifters like radiation. Consider bowel cancer. Willacy could have done a story on the epidemic of bowel cancer in Japan any time since his posting to the country. The rise of bowel cancer in Japan over recent times hasn’t just been a possible worst case rise of a few percent in some people that full blown reactor steam explosions may have caused, but an actual rise of about 500 percent which has turned a minor cancer in Japan’s health system into a major one. There are now 80,000 extra bowel cancer cases in Japan every year compared to the 1970s. There were once 20,000 new cases annually and there are now over 100,000 with only a small population increase. This is a real 500 percent per person increase. Let me repeat, as things stand, the bowel cancer epidemic will produce 3.2 million extra bowel cancers in Japan over the next 40 years compared to a disputed estimate of 4,000 extra cancer deaths due to the Chernobyl accident over a similar period. This is the difference between the cancer players and the wannabes. What caused this bowel cancer increase? The World Cancer Research Fund is pretty much the IPCC of the cancer world and it summarises the state of cancer research in reports every decade. It had suspicions about possible culprits in its 1997 report, but confirmation of the possibilities only came in its 2007 update and subsequent followup statements. Of all the diet and lifestyle changes in Japan in past decades, there is only one with a demonstrated solid causal connection to bowel cancer … the increase in red and processed meat intake. The other significant lifestyle cause of bowel cancer in the west is obesity, but rates in Japan are still very low. Interspersed within the body of what is primarily a book about the triple reactor meltdowns are heart rending accounts of personal tragedy wrought by the tsunami and its preceding earth-quake. These interludes are so truly gut wrenching that a return to the story of the meltdowns comes as a welcome relief. A book dominated by an accurate account of the tsunami would be well nigh unreadable, but when Willacy returns to the nuclear failure storyline, there are no deaths and very few injuries to describe, so the accounts of horror, death and despair give way to fascinating tales of cabals and corruption, intrigue and incompetence, cover-up and confusion. This is mixed in with accounts of the heroic deeds of firefighters and nuclear staff at the stricken reactors. It’s only when we get to the evacuation that Willacy returns to chronicling death and despair. But suddenly Willacy’s skepticism and investigative skills evaporate, he never questions whether the evacuation was necessary, or who should take responsibility for its deadly outcomes and ongoing impacts. Was the evacuation required? What were the alternatives? Suppose for example, that the 150,000 Fukushima evacuees had been resettled in Australia. What would happen to their cancer risk? Particularly with regard to the children? Their cancer rates would rise. How much? Perhaps as much as 50 percent. The age standardised cancer rate for Japan is about 200 per 100,000 per year compared to 314 per 100,000 per year in Australia. To the extent they adopted Australian lifestyles, the cancer rate rise in the adults might be small (a slow decade by decade increase). But the cancer rates in their children as adults would quickly rise toward Australian levels. This is a much studied global phenomenon (see the World Cancer Research Fund’s 2007 report for a readable account). How would this level of change in cancer risk, particularly for children, compare with living in the Fukushima exclusion zone? Experts pretty much agree that single radiation doses in the range of 100 mSv will raise cancer risk by, at most, a few percent. Most of the exclusion zone wouldn’t even deliver this much radiation over the course of a year and radiation levels are dropping rapidly. Is there an expert anywhere willing to suggest that living in the evacuation area would raise cancer rates by 50 percent? Not likely. The implication is clear. The evacuation was ordered to prevent a risk far smaller than the risk of moving to Australia. Willacy documents the tragedy of this misguided policy with great detail. The evacuation caused immense and on-going suffering. Everything from suicide by self-immolation to elderly people being left to die in nursing homes. Animals also paid a high price with many thousands left to starve. Was so much death and despair a good choice over a trivial risk? A risk lower than that of moving to Australia? Pretty obviously not. So why was it ordered? What kind of advice was Kan being given? Did he reject rationality to pander to anti-nuclear panic merchants or were his advisers simply incompetent? That’s a book that needs to be written. MIT Climate CoLab update – the result?